S.W. Betz Vendor Spotlight: SpaceGuard | S. W. Betz Company, Inc.
We’ve written several helpful articles on how useful wire partitions are for any warehouse or facility. One of the leading names in wire partitions and wire storage solutions is SpaceGuard Products, serving government, industrial, warehouse, and various other industries. It’s important to only offer the best quality equipment to our clients for solutions that last. Learn more about SpaceGuard Products, and how their wire partitions and storage solutions are some of the best available. You can expect the best service and products from this manufacturer, which is a part of the reason they’re a leading warehouse storage brand. S.W. Betz is proud to sell and install SpaceGuard equipment for your storage needs. Not only do they manufacture durable wire partitions, but storage lockers, infill panels, and pallet rack safety systems as well. 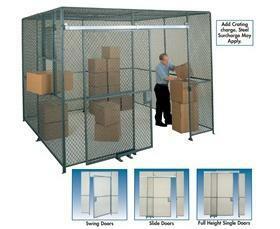 They have versatile cages, doors, locks, shelves and more to fit your specific needs and applications. Known for carrying high quality wire mesh products, their welded wire is built to last and provide outstanding protection and security. When searching for a high quality storage solution for your warehouse or facility, SpaceGuard is the place to start. For more information on their products we offer here at S.W. Betz, or for questions on pricing and installation, give us a call. Our knowledgeable team can provide any insight you need on SpaceGuard or any of our warehouse storage solutions. We carry a variety of top warehouse equipment brands, such as: Morse, Wesco, Magliner, and Quantum Storage Systems, Cogan, and of course, SpaceGuard. This entry was posted on Tuesday, February 2nd, 2016 at 4:29 pm. Both comments and pings are currently closed.